You might have heard about a book published 21 years back, Hindu Temples, What Happened To Them? Let’s examine the issue from various angles. Read Srikanta Ghosh’s Indian Democracy Derailed : Politics and Politicians, published in 1997. On pages 73-74 he gives some key information. Srikanta Ghosh was with the Law Research Institute of Calcutta. – The Charminar temple was in her memory. – Even now (in 1997 when the book was written), a Harijan woman is the trustee of the temple. – Bhagyalakshmi temple’s desecration on November 23, 1979, has no parallel. See this clipping from the book, for more details of why the temple was attacked in 1979. 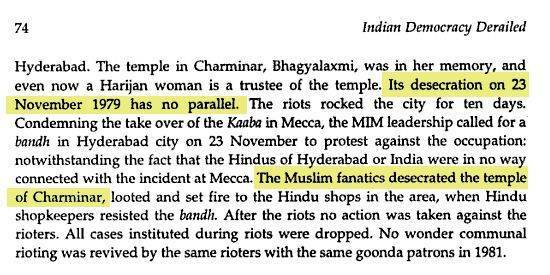 Read Roshen Dalal’s book (page 220) where it is described as to why Goddess Lakshmi is linked to Charminar’s guard. This entry was posted on September 23, 2016 by Sanatan Dharm and Hinduism in ancient indian temples, HINDUISM SCIENCE and tagged bhagyalakshmi temple, Islamic Destruction of Hindu Temples..